Which fruit is the largest tree fruit in the world, do you think you could get the answer? Yes, if u said Jackfruit, then u r right. Our own jackfruit. Jackfruit is the largest known tree borne fruit. Even a small jackfruit weighs in at 10-15lbs (5-7kg), and farmers have recorded specimens of more than 100lbs (45kg). Jackfruit is believed to have originated in Southern India thousands of years ago, now cultivated worldwide in the tropical regions of the Indian subcontinent, Thailand, Malaysia, Indonesia and Brazil for its fruit, seeds, and wood. The tree grows best in tropical humid and rainy climates but rarely survives cold and frosty condition. Jackfruit is a huge tree that grows to as high as 30 meters, larger than mango, breadfruit, etc. Jackfruit is recognized for its unique shape, and size. it is also rich in energy, dietary fiber, minerals, and vitamins and free from saturated fats or cholesterol; fitting it into one of the healthy treats to relish!Jackfruit consists of soft, easily digestible flesh (arils) made up of simple sugars like fructose and sucrose. Seeds and green, immature and unripe fruit employed as vegetable in many Asian countries. The word jackfruit comes from Portuguese jaca, which in turn, is derived from the Malayalam word chakka. For more precise, chakka is often referred to as the pre-ripe form and the ripe form is cas other names, too: kathal in Bangladesh, kanun in Thailand and nangka in Malaysia. 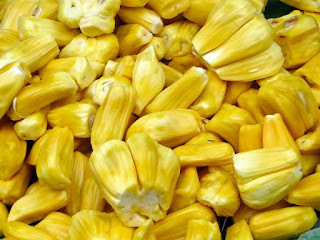 The jackfruit is made up of hundreds or even thousands of individual flowers that are fused together. We eat the "fleshy petals" that surround the seed, which is the actual fruit. Jackfruit is a true super-fruit: All the things from tree can used for various purposes. Almost everthing is useful. The unripe fruit must be cooked in order to eat it, but the ripe fruit is amazing raw. Jackfruits can be dried, roasted, added to soups, used in chips, jams, juices, ice cream. The seeds can be boiled, roasted or ground into flour. Even the tree itself is valuable: high-quality, rot-resistant timber for furniture and musical instruments. While the outer thick skin of the jackfruit is a much sought after feed for cattle, the leaves of the jackfruit tree are equally in demand by goat farmers. The orange bark has been used to dye the traditional robes worn by monks The trees produce a latex-like substance that can substitute for glue. Wood from the gigantic trees is also used for lumber. Besides its high nutritional value, the fruit is very versatile. The seeds, young fruit, and mature varieties are all edible. The timber from jackfruit trees is also valuable. 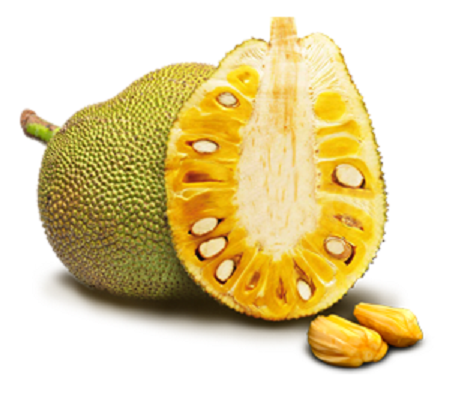 Jackfruit's outer surface is covered with blunt spikes which become soft as the fruit ripen. Its interior consists of eye-catching orange-yellow color edible bulbs. Each bulb consists of sweet flesh (sheath) that encloses a smooth, oval, light-brown seed. There may be as many as 50 to 500 edible bulbs embedded in a single fruit interspersed in-between thin bands of fibers. Jackfruit seed encased inside a thin, transparent outer cover. It largely composes of starch and protein. Each seed measures about 2 to 4 cm in length, and 1 to 3 cm in thickness.Almost all the parts of the tree secrete white sticky latex-like milk (juice) upon infliction of injury. As a meat replacement, jackfruit when harvested young, is a low-calorie plant that has the look and texture of real meat. By using jackfruit to replace meat in meals, you’ll also cut back on negative environmental factors that many large-scale farms unfortunately create: greenhouse gas emissions, animal cruelty, and water usage. Harvesting young jackfruit before it’s fully ripened, helps in resembling meat like pulled pork or beef, because of its texture and natural sugars in the fruit have not yet developed. Next time u taste it, please do feel it.. Yes, Jackfruit does feel like, look like, and chew like meat. It is easy to grow. It survives pests and diseases and high temperatures. It is drought-resistant. The fruit is rich in potassium, calcium, and iron, making it more nutritious than current starchy staples. Its anti-diabetic effect is due to its high constituent of flavonoid and proanthocyanidin. The sugar in Jackfruit is easily digestible and belongs to the category of Slowly Available glucose (SAG) whereby the glucose is gently released in the body thereby lowering its glycemic index. This suggests why this fruit is suitable for diabetic patients as it does not affect the blood glucose level. Jackfruit is essential for getting rid of unwanted toxins from the colon due to its high constituent of anti-oxidants. It is important to note that allowing these toxins to accumulate in the colon could possible result to colon cancer. The seeds are rich in thiamin and riboflavin which help in turning the food you eat into energy and keep your eyes, skin and hair healthy. The seeds also provide small amounts of minerals like zinc, iron, calcium, copper, potassium and magnesium. Jackfruit is a rich source of vitamin A, beta-carotene and lutein zeaxanthin which are essential for maintaining and promoting healthy vision. These vitamins protect the eyes against free scavenging radicals, viral infection and bacterial attacks that can lead to macular degeneration, night blindness, the risk of cataract and loss of sight. Jackfruit seeds contain compounds that have an antimicrobial effect, which could help prevent contamination with bacteria that cause food borne illnesses. These seeds have also been used in traditional medicine to help with digestive tract problems, although more research is necessary to verify these potential benefits. Jackfruit seeds contain lectins which have been scientifically proven to be effective against fungal attacks. Thanks to its large amount of potassium your blood will be controlled which will automatically reduce the chances of heart attack and stroke. It is one of the rare fruits that is rich in a B-complex group of vitamins. It contains outstanding amounts of vitamin B-6 (pyridoxine), niacin, riboflavin, and folic acid. Jackfruit is an excellent source of iron, vitamin K, vitamin C, vitamin E and vitamin A which are all essential for preventing anaemia and fighting against the deficiency of red blood cells in the blood. Jackfruit increases iron absorption with vitamin C in the body. In addition to bone-building magnesium, jackfruit contains calcium, which may help reduce the risk of In addition to bone-building magnesium, jackfruit contains calcium, which may help reduce the risk of osteoporosis or even osteopenia,which is the onset of osteoporosis. This fruit is rich in antioxidants. They are helpful in decreasing the aging, while the water included in jackfruit will make your skin moisturizer. It is also helpful against wrinkle. The jackfruit also provides a potential solution to countries facing problems with food security, therefore called a miracle crop. This is a perennial fruit does not require replanting, nor does it require much care, unlike other crops such as wheat or corn. It starts yielding after 3-7 years of planting. Eventually, a yearly yield might be in the 150- to 200-fruit range. Fruits are typically picked in summer and fall. Jackfruit is harvested straight from the tree. Jackfruit could be a replacement for wheat, corn and other staple crops under threat from climate change. Jackfruit, despite its huge potential, remains underexploited as a food crop in India, That is beginning to change, as new initiatives are taken to promote the crop by expanding its use as a canned vegetable and as a processed food.The effort coincides with a global push to expand food production, especially in developing countries which are expected to face growing challenges to feed their people in the coming decades. Kerala, the largest jackfruit producer in India, also wasted colossal amounts of the fruit every year. This is even after exporting 50,000 tonnes of the fruit annually to various places in North India,high cost of labour and transportation cost may be the reason. Though there is good demand, since there is no organized network and markets for jack, they are left in the trees and spoiled. In India traditionally many products are made out of jackfruit. With advancement in food and nutrition research, now there many commercial products are available in the markets. Traditional foods are chips, wafers, kadubu-a type sweet made of jack, chakka puzhuku, chakka varattiyath. Now we get jams, jellies, ice creams made out of jackfruit. Jam, jelly, syrup, dry and frozen jackfruits, Jackfruit Kabab, Jafi-Jackfruit coffee, Bar-B-Que Jack are the recently added products. Now the fruit is processed into products as diverse as flour, noodles, papad, pizza, tachos,sandwiches. Jackfruit is also canned and sold as a vegetable for export. So many ways and we are not utilising it. Jackfruits are an excellent fruit with incredible health benefits. Above all it can be used either as a vegetable or fruit ,All tree can be utilised. Jackfruit is a nutritional boon to people in Vietnam, Malaysia and Bangladesh, where it's the national fruitCountries like Thailand, the Philippines and Sri Lanka have taken the jackfruit to the next level by coming with value-added products. But what to change is the ignorance given by people, If treated well jackfruit is definitely going to be the next big thing on Indian dining tables soon. Giving attention to the many attributes of jackfruit, organizing festivals and advocating for more awareness of what the fruit could do is the only way to help. It all started about 125 years back when a Parasi banker wanted to have home cooked food regularly in office and gave this responsibility to the first ever Dabbawala. Other people also liked the idea and the demand for Dabba delivery soared. Dabbawala, (one who carries the box), in the Indian city of Mumbai. They carry and deliver freshly made food from customer’s home in a lunch box (Dabba) and deliver it to offices. Dabbas are safely collected back on the the same day. The dabbawala service is legendary for its reliability. Since it was founded, in 1890, it has endured famines, wars, monsoons, Hindu-Muslim riots, and a series of terrorist attacks. It has attracted worldwide attention and visits by Prince Charles, Richard Branson, and employees of Federal Express, a company renowned for its own mastery of logistics. are perfectly aligned and mutually reinforcing. On a given day, a dabba passes though several hands before reaching back. In the morning a dabbawala picks it up from the customer’s home and takes it (along with other dabbas) to the nearest train station, where it is sorted and put onto a wooden crate according to its destination. It is then taken by train to the station closest to its destination. There it is sorted again and assigned to another one, who delivers it to the right office before lunchtime. 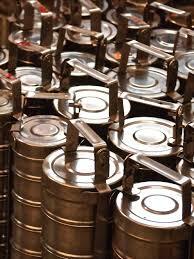 In the afternoon the process runs in reverse, and the dabba is returned to the customer’s home. The dabbawalas essentially manage themselves with respect to hiring, logistics, customer acquisition and retention, and conflict resolution. This helps them operate efficiently and keep costs low and the quality of service high. All workers contribute to a charitable trust that provides insurance and occasional financial aid—for example, when a worker needs to replace a bicycle that’s been stolen or is broken beyond repair. For the dabbawalas, having the right process in place means more than simply implementing efficient work flows. It also entails just about everything in the organization, including the way information is managed, the use of built-in buffers, and a strict adherence to standards. To convey information, the dabbawalas rely on a system of very basic symbols. The Coding system evolved through various stages with time. The lid of a dabba has three key markings on it. 1st is a large, bold number in the center - the neighborhood where the dabba must be delivered. 2nd is a group of characters on the edge of the lid: a number for the dabbawala who will make the delivery, an alphabetical code (two or three letters) for the office building, and a number indicating the floor. 3rd is a combination of color and shape, and in some instances, a motif—indicates the station of origin. Customers supply small bags for carrying their dabbas, and the variation in the bags’ shapes and colors helps workers remember which dabba belongs to which customer. In the corporate world, it’s uncommon for managers to strive for that kind of synergy. While most, if not all, pay attention to some of the pillars, only a minority address all four. Culture, for example, often gets short shrift: Too few managers seem to recognize that they should nurture their organizations as communities not just because they care about employees but because doing so will maximize productivity and creativity and reduce risk. Also managers shouldn’t think of themselves merely as leaders or supervisors; they also need to be architects who design and fine-tune systems that enable employees to perform at optimal levels. The dabbawalas’ success is proof that with the right system in place, ordinary workers can achieve extraordinary results. What makes Dabbawalas so unique? They are illiterate yet they understand coding system for fault less deliver. The two ‘C’s are convenience, and charging a very minimal fee, the Mumbai Dabbawalas come to the rescue of the wife or the mother. People have their office bags to carry in extremely, unimaginably crowded trains and to carry one additional dabba is equivalent to asking for too much space in a local train. There is no food as cheap as home-cooked food. There is no food as hygienic as home-cooked food. There is no food as satisfying as home-cooked food. The dabbawalas work for about 8-9 hours a day. They leave their homes in the suburbs by 7am to be able to start collecting dabbas at 9am and deliver them to the different work places by lunch time. While the people are enjoying their home cooked meal during lunch time,the dabbawalas find a corner on the side of the street or some place near their delivery location and make some time to eat their own lunch. Then, just after the lunch hours, they start collecting the same dabbas that they had delivered. By around 5pm, all the dabbas are delivered back to their respective residences. Also in recent years they have started an initiative, which I think is thoughtful, inspiring and incredible. They gave the left over food collected from dabbas among people living on the streets, those who sleep on pavements, people living in slums, etc. They also prevent criminal wastage of food at social functions like weddings, parties and in festive season by collecting leftovers and delivering to needy. We all invariably end up throwing a lot of left-overs at home or wasting a lot of food, and that eventually goes to the dumps. Here, it is helping to save the lives of several malnourished, poverty-stricken people living on the streets in India. I hope we can all learn a very vital lesson for this and learn to giveq back to the needy. This doesn’t even require any extra effort or expenditure. It is just what we thought we weren’t going to eat/use that is being given to the needy. It isn’t selfless but is immensely kind. The dabbawalas play a very important role in the daily life of Mumbaikers. They make sure that nearly 200,000 people get their lunch in time at their offices or schools. So the dabbawalas pick up your home cooked hot meal from doorstep, deliver it to the concerned person and then return the empty box to your doorstep again. For the entire service process, they charge anything just below Rs 800 per month. Unbelievable! The Dabbawalas are equipped to serve us with the prevailing technologies too. You can SMS them or you can also login into the site Mydabbawala.com to avail their services.